Four of the world's biggest pharmaceutical companies are considering launching an interactive TV channel in Europe. 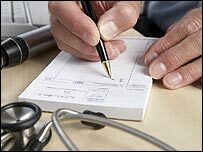 The prospect has caused outrage among some consumer groups, because advertising prescription drugs directly to patients in the European Union is illegal. They warn that the pharmaceutical giants will find it impossible to give unbiased advice about their own products. But the drug companies involved - Pfizer, Novartis, Johnson & Johnson and Procter & Gamble - insist they are only interested in giving reliable high quality health information which would help patients when they were discussing their treatments with doctors. They have even made a ten-minute DVD of what the new interactive TV channel might look like - although a spokesman for one of the firms concerned said the plan was at a very early stage. It does not exist, nor is it in development. "The European Patient Information Channel is simply a name given to an interactive information tool," he says. "It does not exist, nor is it in development. The purpose of creating this model was to provide an example of how quality information might be provided to Europeans in the future. "We spend years building knowledge about our medicines and are interested in showing how we can share some of this information with European patients to try and ensure medicines are used properly and deliver maximum benefit". The drug companies also insist they have no wish to challenge the current ban on advertising prescription drugs directly to patients in Europe. Those regulations are currently being reviewed by the European Commission. Marcel Smeets, general director of Association Internationale de la Mutualite, an association of health insurers, thinks the timing of the latest project is no coincidence. "I think it will bias the discussion in real life medical practice," he says. "A patient will be convinced by the power of television and the power of the nice-looking and well-informed and bright doctor sponsored by the industry. "A doctor has a much broader and much unbiased view on all the available products. It should be the doctor who makes the unbiased analysis and prescribes without any economic incentive the best medicine and treatment". 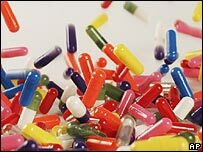 There are only two countries in the world where direct-to-patient commercials for prescription drugs are allowed - New Zealand and the United States. Drug companies routinely advertise in the commercial breaks of popular shows on regular news or entertainment TV networks. Many of the commercials follow a tried and tested formula. They begin by describing the symptoms of a medical condition and asking the viewer if they are experiencing anything similar. If so, they advise that they may have a product which can help and recommend making an immediate appointment with a doctor to discuss whether this would be appropriate. It is a lucrative strategy, according to Theresa Alvez of Health Action International, a Dutch-based campaign group which has become one of the leading opponents of prescription drugs on TV. "In the US, they get back at least three times what they spend on advertising in increased sales of their drugs," she says. "There is a clear conflict of interest here. They are not going to tell patients about the other treatments which are on offer, which doctors might consider to be more appropriate. This is all about maximising profits for shareholders". 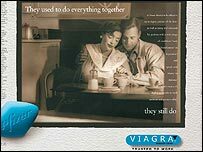 The bombardment of American TV viewers with adverts for prescription drugs has even prompted artist, Justine Cooper, to create an entire spoof ad campaign in protest. Her "Havidol" commercials all feature smiling and beautiful people, who try to "help" patients who think they are fit and healthy understand that they are actually suffering from a serious medical condition. A spokesman for her exhibition at the Daneyal Mahmood Gallery in New York said they had never seen people embrace a concept so enthusiastically or quickly. "With Havidol Justine Cooper turned disappointment with life into a clinical diagnosis - and everyone identified with the condition."